Tooth loss is a traumatizing experience, not only for your dental health, but also for your self-esteem. Dental implants are the most innovative, effective, and natural-looking tooth replacement treatment. Beyond treating tooth loss, dental implants can also be used to replace broken and decayed teeth that cannot be preserved with other restorations. In the beginning, dental implants were only used to replace one tooth. Now, we are able to replace full arches of teeth in as little as one appointment with an implant-supported treatment called “teeth next day.” Dental implant technology allows us to restore your ability to chew and smile with confidence. At Rejuvenation Dental, we offer state-of-the-art dental implants in Scottsdale, AZ, so you can enjoy their life changing benefits. 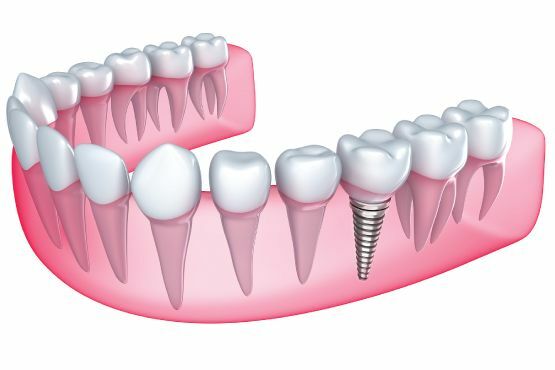 Dental implants are titanium posts that are inserted into the jawbone under the gumline. After the titanium post is securely in place, a prosthesis can be mounted over them to restore the teeth above the gumline. Dental implants fuse to your jawbone, providing a durable anchor for the prosthetic teeth. At Rejuvenation Dental, we use the latest technology and most effective techniques for placing your dental implant post. Our onsite 3-D imaging technology allows us to take in-depth images of your jawbone to find the best placement site and map out a treatment plan that will provide the best results. Dental implants can provide support for replacing one or multiple teeth. At Rejuvenation Dental, we can can customize your dental implants treatment to fit your individual conditions. Single tooth replacement. Traditional dental implant treatments replace a single tooth. After the implant post is inserted in the jawbone, some time is needed for the implant site to heal. Once the implant site has healed, we attach the “abutment,” which serves as a connector piece to the crown. The crown is then placed over the abutment, looking and functioning like your real tooth. Replacing multiple missing teeth. Multiple teeth can be replaced with an implant bridge. With implant bridges, we can replace multiple teeth with fewer implant posts, making it a cost-effective and functional solution to advanced dental problems. Renovating your dentures. At Rejuvenation Dental, we also use dental implants to improve the function and aesthetics of dentures. With “snap in dentures,” we are able to use dental implants to secure your dentures in your mouth, so you can eat, speak, and feel more confident without your dentures sliding around and popping out. Dental implants serve as an attachment to hold your dentures in place during the day with the ability to remove them at night. With “snap in dentures,” you also won’t have to worry about the pinching discomforts of traditional dentures. Permanently restoring full arches with “Teeth in a Day.” Implant-supported “Teeth in a Day” are one of the most revolutionary restorative treatments. “Teeth in a Day” use 4-6 dental implants to permanently replace entire arches of missing, broken, or severely decayed teeth in as little as one appointment. Unlike “snap in dentures,” “Teeth in a Day” are a permanent treatment, and remain secured in your mouth like your real teeth. Enhanced appearance. Dentures and dental bridges can sometimes look bulky and unnatural. Dental implants are the most natural-looking tooth replacement option. Since they are fused to your jawbone, they securely fit in your gumline just like a real tooth. Dentures and untreated tooth loss can also lead to premature wrinkles, making your face appear sunken in. Dental implants stimulate jawbone growth, making your face look younger and healthier. Speak with confidence. Dentures can slip around in your mouth, requiring you to adjust them frequently, which can make it hard to pronounce words. It’s not uncommon for denture patients to suffer from slurred speech. With dental implants, you can speak confidently knowing your teeth are securely in your mouth and won’t slip out during an energetic conversation. Eat your favorite foods again. Tired of having to adjust your diet, because your dentures cannot chew the food you like? Chewing with dentures can cause a lot of discomfort. Top arch dentures also cover the roof of your mouth, making it difficult to taste your food. Dental implants are anchored in your mouth, so you can eat apples, ribs, chicken wings, and all the kinds of food you enjoyed before tooth loss. ​​​​​​​Improved digestion. Dentures and untreated tooth loss can make it hard to chew your food adequately. Your body has a hard time digesting food that isn’t properly masticated, a term used to describe the chewing process. Dental implants allow you to chew your food better, leading to better digestion and overall health. If you are missing one or more teeth or suffering from severe decay, then you’re most likely a candidate for dental implants. However, some candidates are more ideal than other. We will assess your candidacy for dental implants during your initial consultation. To determine dental implant candidacy, we use our 3-D Imaging technology to make sure your jaw has adequate density to support the implant post. If your jawbone has atrophied too much from tooth loss, we will recommend bone grafts as a complementary treatment to prepare for dental implants. If you also have gum disease, we will need to treat your gum disease, before placing the implant. Patients that are pregnant will also need to wait until after their pregnancy to move forward with dental implants. Ready to take the next step in restoring your smile with dental implants? The entire team at Rejuvenation Dental understands the severity of tooth loss and is here to help. As a member of the International Congress of Oral Implantologists, Dr. Brent Call is a skilled dental implant provider and stays-up-to-date on the latest training and techniques. Schedule a consultation with Dr. Call at Rejuvenation Dental today at 480-771-2133.